It has been eight years since Andy Lau (劉德華) last held a concert for his fans. Last year, Andy cancelled all his scheduled concerts after he fell from a horse while filming for an advertisement in Thailand. 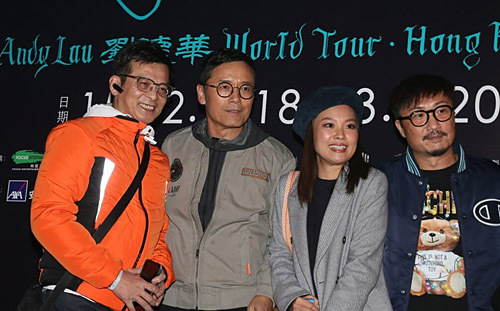 As Andy recovered from his accident, he finally returned to the Hong Kong Coliseum and kicked off the first of 20 concert sessions. As expected, many fans bought tickets for the concert and the concert was sold out. Andy’s wife Carol Chu (朱麗蒨) and six-year old daughter Hanna (劉向蕙) were also there to support him. 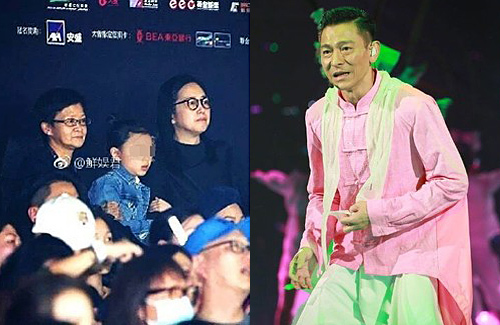 Many of Andy celebrity friends were there to cheer him on, such as Felix Wong (黃日華), Michael Miu (苗僑偉), Liza Wang (汪明荃) and her husband Law Kar Ying (羅家英), Ronald Cheng ( 鄭中基) and Ron Ng (吳卓羲). As one of Hong Kong’s superstars, Andy did not disappoint, and gave an electrifying performance. Andy even gave fans a special treat by suspending himself in the air with a cable to the top of the Coliseum. Throughout the performance, Andy will drop up and down and was able to “fly” around the Coliseum and get close to his fans. In addition to his daring stunt, Andy also took off his outfit and showed off his toned muscles while singing to “Chinese” <中國人>. The crowd cheered excitedly, while Andy’s daughter curiously looking at her father and Carol passionately clapped. The concert was filled with passion and energy. Andy’s performance was on par with his prior performances before his accident. As Andy reflects upon his past years, Andy is grateful for the support and blessing that his fans have sent him. Andy even joked that if he had a child since he last held a concert, the child would be years old by now so he should enjoy the moment right now. It’s nice to see the Tigers so supportive of each other. The longevity of their friendship is heart warming. Very sweet and liberating for Carol and their daughter to be there too. I like Felix Wong and Michael Miu. They are being supportive of their long-time friends.